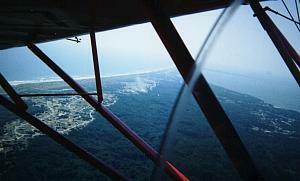 Kitty Hawk Searching for shipwrecks in the Outer Banks of North Carolina. Photo 1. One and a half hours into the flight from Richmond, Virginia: the Wright Memorial (at center of circle) and First Flight airstrip running right to left along bottom. I landed at nearby Dare County Regional Airport (MQI) on Manteo Island (in the sound between the outer banks and the mainland). This is a nice airport with fuel, soda and snack machines, and comfortable couches. Photo 2. 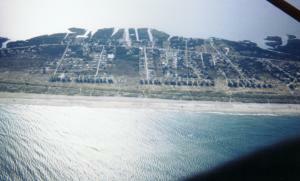 Sun, sand, sound and ocean on the Outer Banks. Photo 3. About 35 minutes south of Kitty Hawk: the Cape Hatteras lighthouse (barely visible between struts and below cross brace). You can also see where it once stood - closer to the ocean. Photo 4. 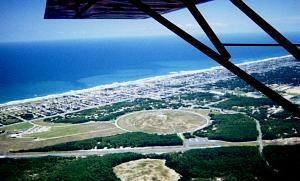 A few minutes later: turning final for Billy Mitchell Airport (HSE) in Cape Hatteras (the runway is the smudge visible at center of photo). 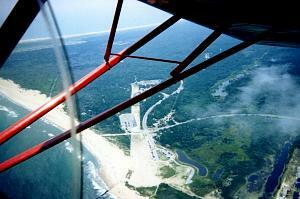 The beach is a short walk across the runway and over a small dune. The airport has no services but the beach is beautiful and very desolate. Photo 5. 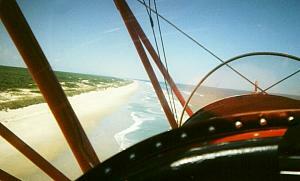 Flying low over a secluded beach somewhere in the outer banks (not within a wildlife refuge!). Photo 6. 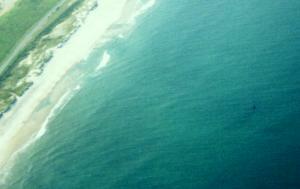 A shipwreck in northern Hatteras (visible in right of photo with part of one end just poking above the water). This may be a Civil War steamer called the Oriental. If you ever look at a map of the shipwrecks in the Outer Banks you will see that they line the entire shoreline in an unbroken string from one end to the other. N 36 33.612 W 75 52.112 Located in the far northern outer banks (actually into Virginia), past Corolla and Corova (which is accessible by driving on the beach only) and just past the barrier that stops traffic from traveling any farther north. A very complete outline of a large iron ship is visible just beneath the surface. This may be the "Clythia", a 214' long iron-hulled bark that ran aground in 1894 while carrying a load of Italian marble. The marble was salvaged in the 1960's. N 36 14.940 W 75 46.784 This wreck stuck up above the water. This area is populated by luxury cottages in northern Duck. N 36 01.885 W 75 39.729 This wreck is right down the runway centerline of First Flight airport. I believe it may actually be two wrecks - the Greek tanker Kyzickes, which foundered in 1927, and the Swedish freighter Carl Gerhard, which came to grief in 1929. These are known locally as the "triangle wreck" because they touch and form a roughly triangular shape. N 35 47.226 W 75 31.795 This wreck was just north of Oregon Inlet. N 35 42.939 W 75 29.273 Northern Hatteras island near a parking area. Photo on left. After doing a little research I believe this may be the "Oriental". The Oriental was a Federal iron-hulled screw steamer, lost in 1862 after becoming stranded on a sandbar. The steam engine still sticks up eight feet above the water at low tide! This is amazing when you consider that it's been pounded by the surf for 140 years. N 35 32.348 W 75 27.837 Further south on Hatteras island. Finding information on these wrecks was aided by a searchable shipwreck database provided by NOAA http://chartmaker.ncd.noaa.gov/hsd/hsd-3.html. Here's a nice website with photos of old shipwrecks in the outer banks: http://dragonfantasy.com/OuterBanks/shipwrecks.htm. Some of the wrecks are so close together that it was difficult to tell which one my GPS coordinates pointed to. Photo 7. 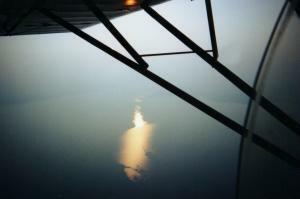 The sun glinting off the lower James River on the return flight.